Lovely Soup - beautiful, beautiful Soup!! 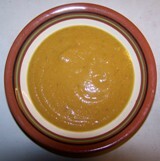 This is originally a French carrot soup recipe, but with red lentils added as an excellent protein source. Red lentils have had their hulls removed, cook faster and are excellent to add to soups. Use this carrot soup recipe as inspiration and you’ll soon find ways to alter you favorite vegetable soup recipes by adding lentils for a more balanced meal. Vegetables offer carbohydrates but you also need protein that keeps your hunger at bay for longer. Olive oil is the best choice of fat for this yummy soup. 1. Peel and chop the vegetables. You will be blend the soup later so there is no need to chop finely. 2. Heat the oil in a big pot and add the onion and cook until it softens. 3. Add the rest of the vegetables and the spices and cook for a few minutes while stirring. 5. Bring to a boil and then lower the heat and let the soup simmer for 20 minutes. 6. Add the lentils and leave to cook for another 10 minutes or until the lentils are soft. Add some water if necessary. 7. Let the soup cool a bit and remove the bigger sage leafs before mixing the soup in the blender. 8. Pour the soup back in the pot. Warm it up again and salt and pepper to taste. Serve with a salad if you want to keep it low-carb, otherwise try the Mediterranean way and dip whole wheat bread in the soup.